As we observe the seventh annual World Pneumonia Day, individuals and organizations from around the world are coming together once again to raise awareness about pneumonia and make sure that every breath counts. 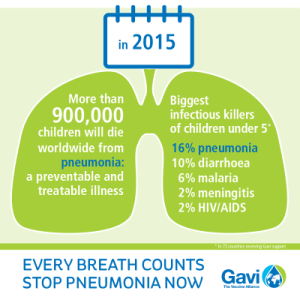 Each year there are approximately 900,000 deaths in children under the age of five from pneumonia across the globe. 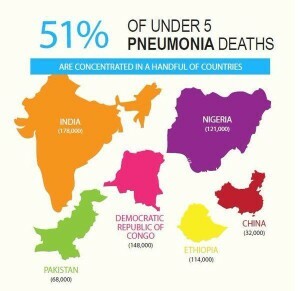 While 51% of these deaths occur in only 6 countries, pneumonia isn’t just a threat to children in third world countries. The CDC reported that pneumonia is the leading infectious cause of hospitalizations and deaths in U.S. adults, costing more than $10 billion in 2011 alone. Many factors contribute to pneumonia, and so there are many ways we can work to help prevent, treat and control this disease. Consider the following five simple but effective interventions. Vaccines against whooping cough (pertussis), measles, Haemophilus influenzae type b (Hib) and pneumococcus can all help reduce the incidence of pneumonia. However, for many of the world’s population, the issue is one of access. While this is amazing progress, Dr. Levine goes on to explain that an estimated 51% of the world’s infants live in countries that do not offer access to pneumococcal vaccines. Of course, getting vaccines to these children must be a top priority. In order to keep improving prevention, it is critical that we work with find ways to offer effective pneumococcal vaccines at affordable prices so that they are eventually introduced in all countries – but especially poor countries and countries that have a high disease burden. Because hands are the principal carriers of disease-causing germs, washing them with soap at critical times, like after using the toilet or before handling food, can help reduce the rate of pneumonia. In fact, proper hand washing with soap has been shown to reduce the risk of respiratory infections like pneumonia by 25%. It is critical that we support the various organizations that are working to improve access to safe drinking water, and promote healthy behaviors that will improve sanitation and more effective hand washing practices. Children who are malnourished when they contract pneumonia are often those who won’t survive. Unfortunately, their bodies are not always strong enough to maintain the heavy breaths they need to draw in an adequate supply of oxygen. Exclusive breastfeeding for 6 months and continued breastfeeding and nutritious solid foods for at least the first two years can help ensure that children are receiving adequate nutrition. This, in turn, helps them to be better able to recover from pneumonia if they should become infected. Diseases such as pneumonia are often associated with household air pollution. By encouraging the use of clean cookstoves and fuels we can dramatically reduce smoke emissions and the resulting exposure, and therefore help reduce the burden of diseases such as pneumonia. According to Dr. Levine, as many as half of early childhood pneumonia deaths result from not being rapidly diagnosed or treated. Therefore, intervention is essential. Antibiotics, such as amoxicillin, can prevent the majority of pneumonia deaths, and cost only about $US 0.21-0.42 per treatment course. As a global community, we are responsible for ensuring that those who are most in need of pneumonia interventions have access to affordable vaccines, diagnostics and medicine. Back in 2013, Dr. Mickey Chopra, global head of UNICEF’s health programs, explained the following: if the 75 countries with the highest death rates from pneumonia were offered the same type of interventions that the richest 20% of households receive, than we could prevent the deaths of 2 million children by the end of 2015. This is a startling statistic. As we near the end of 2015, we can see that there is still more work to be done. Through the concentrated efforts of various national governments, international health agencies and concerned citizens we can advocate for more effective policies and increased funding to reduce the number of pneumonia cases in our world. For more information and to find out how you can be part of the solution, visit the World Pneumonia Day website here. I’m a firm believer in having good sanitary habits. Sanitary conditions are key! Except that even the best sanitary habits are very limited in preventing the spread of airborne infections…. Mahee, explain how good sanitation prevents someone from catching pneumonia… please.